As many as 272 students of National University of Sciences and Technology were conferred bachelors degrees in various disciplines on Saturday in a simple but graceful ceremony. 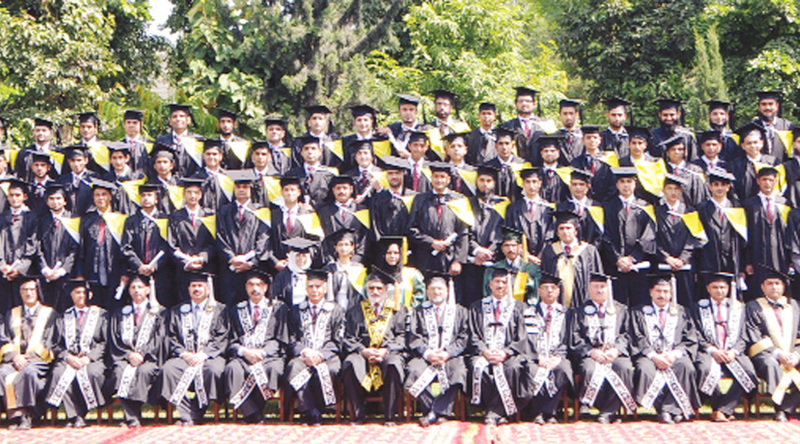 The 17th undergraduate convocation held at the College of Electrical and Mechanical Engineering (EME). The students were awarded bachelor degrees in the disciplines of Electrical, Mechanical, Mechatronics and Computer Engineering. Rector NUST Engineer Muhammad Asghar graced the ceremony as the chief guest, which was attended by graduating students, their parents and relatives. Speaking on the occasion, the rector expressed his gratitude over the splendid performance of the students. He extended his heartiest felicitations to the esteemed faculty, graduating students and their parents. He also spoke about the significance of engineering education in the socio-economic uplift of the country. Asghar also lauded the Higher Education Commission (HEC) for revitalising the role of universities in Pakistan. Since its inception, he maintained, the commission had taken several initiatives towards increasing access to higher education as well as ensuring quality at all levels. He highlighted the role of NUST in higher education, saying in a relatively short span of time, the NUST had achieved a globally acclaimed 250th ranking in the world. “The College of EME has made a significant contribution in attaining this high rank of NUST,” he noted. In his welcoming address, College Commandant Major General Muhammad Shahid highlighted the achievements of the institution during recent years. He said besides 272 fresh graduates, the college had so far produced 2,878 undergraduate, 511 postgraduate and 13 PhD scholars in various disciplines. Gold medals were awarded by the chief guest to the students for their well-deserved and distinctive achievements. The President’s Gold Medal was given for overall best academic performance to Haris Ikram. The Prime minister’s gold medals for best academic performance in each discipline were awarded to Haris Ikram, Zafar Iqbal, Amna Jamal and Rabbia Asghar. The COAS Gold Medal was awarded to Technical Cadet Asad Nisar while the rector’s gold medals for best project were awarded to Ali Salahuddin, Bilal Anjum Ahmed, Ameer Hamza and Shaheryar Baig.